If you were lucky enough to be at ACS on Tuesday evening, April 28, you were treated to a night of entertainment and laughter. 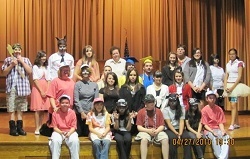 Students from ACS Senior Drama presented a light-hearted, song-filled courtroom story of the Big Bad Wolf. Citizens of the Enchanted Forest, including such well-known characters as Little Red Riding Hood, the Three Little Pigs, and the Boy Who Cried Wolf filled the courtroom to testify against the Big Bad Wolf. Drama members brought their own personalities to the show as they did a wonderful job telling the story. The lively performance had the fairy godmothers, Khrystyna H., and Jenna R., trying to prove the guilt of Mr. B. Wolf, played brilliantly by Jose L. While the evil stepsisters, Glenys B., Damaris A., and Nicole D., defended him. Sydney Grimm, played by Heidi A., and several witnesses told their story of the allegations against the Big Bad Wolf: impersonating a grandmother, blowing homes down, and stealing sheep. In the end the judges, played by Jesse F. and Brandon B. of grade eight, could night decide guilt or innocence, so a hung jury was declared. 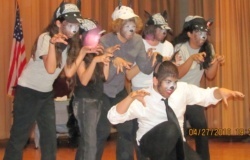 Other cast members included: The Three Little Pigs-Xavier R., Jason L., and Mrs. Rizkallah. The Grandmother-Nicole F. Little Red Riding Hood-Mariya H. Wood Cutter-Nicholas O. The Boy Who Cried Wolf-Danny F. Shepherd-Kasey C. Miss Muffit–Ashley R. The Wolfettes-Mariah A., Kayla C., Vanessa E., BrookLynn C., and Mrs. Shumny. Special guest appearances included Cassandra R. as the custodian and Mr. S as the intermission announcer. 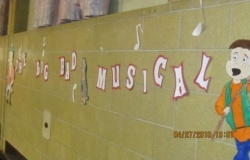 The senior drama teachers, Mrs. Pickering and Miss Makar, skillfully directed the musical.